Biggest Benefits of Internet of Thing training for any Business. Internet of Things (IoT) technology is increasingly being developed for a wide range of business uses. For the wide range of business development, Internet of Things (IoT) usage is increasing day by day. As an example, we can say that, Daimler using IoT to maintain a safe distance. Ericsson Monitor is used to defining ship location and cargo temperature whereas Disney World uses an advanced technique to analysis which country attraction is the most by his visitor’s wristbands. You will get surprised to know that, the Drink Company named Diago uses the smart techniques that can inform the owner that, which bottle is been open? when? and where? Isn’t it smart enough? What a man cant do, all the things are possible with the IoT. Isn’t it! 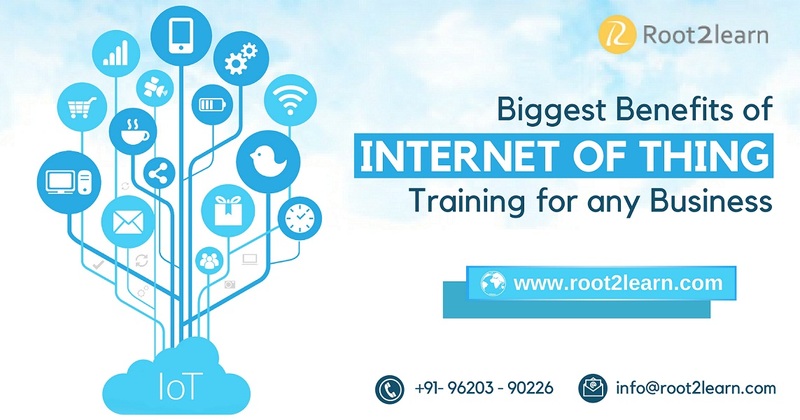 These are some famous examples and benefits of Internet of thing training but still there are thousands of new application and gadget are being developed to enhance the benefits of the big enterprises and its customers. The Biggest Advantages of the Internet of Things Training. It has become very easy to maintain the data which is collected by the IoT that can be sent to your customers or clients with the help of services such as application notification, screen messages or Text & Email. This means that you are giving on-going customers which are above and beyond your today offer. As an example, smart electric meters could remind you to turn off the lights inside empty chambers and food containers could notify about their contents were when to go out of date. Likewise, companies of consumables like printer ink could identify when replacement of ink in needed to the user and transmit them automatically before they drop out. The Internet of Things allows businesses to collect a broad range of information on their customers with their products which gives them a wider judgment of how those products are managed and how they can be improved more for the future to give customers an even better experience. As an example, For example, an IoT-enabled car wheels that could monitor usage and performance in various situations and also helping to make even better wheel design. It could also manage the most suitable wheel for different clients according to their requirement and let them remember if any wheels have found to be defective which needed attention. IoT gadgets allow companies to have a definite, real-time summary of their stock and use of supplies. They can detect where products are and is it been shipped, destroyed or it is in use. The capacity to analyze this data will guide to higher performance that checks stock and other consumables from running out of date and reduces the economic trouble of overall orders. Internet Of Things(IoT) allowed access control including CCTV equipment that can strengthen the security of your business development. Improvements in CCTV technology indicate to track different performance and report security organizations and the police as well. Anyone qualified for security can also watch CCTV footage remotely from anywhere, in the real time, with the help of internet facility. These above mention points are the benefits of Internet Of Things. One must have an advantage of Internet of thing training Training if it gives this many benefits for any business industry.